Home / Contest / Day 2 of #WhatTheBlack ~ #WhatTheBlack is going on? Day 2 of #WhatTheBlack ~ #WhatTheBlack is going on? Guess what I received today! #WhatTheBlack Times came and left me speechless yet again with only one question in my mind #WhatTheBlack is going on? 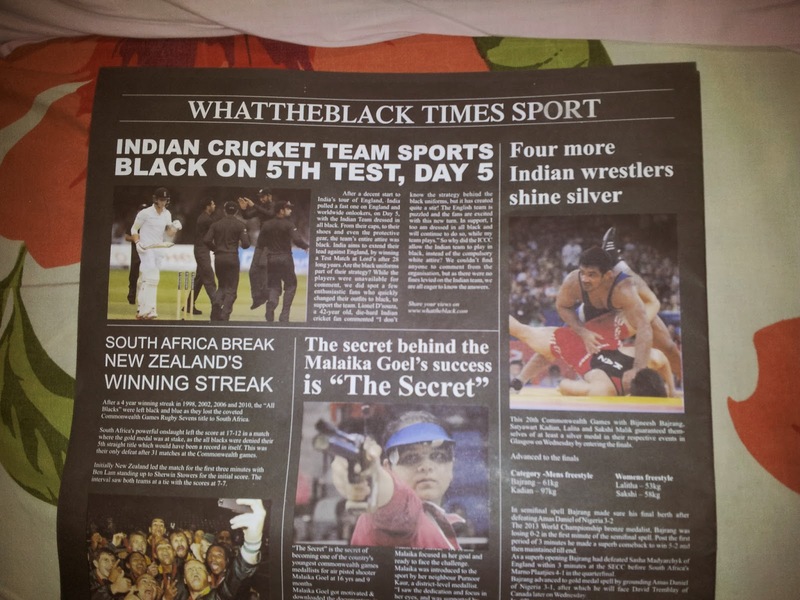 If I was surprised and left speechless yesterday, today the contest went on a whole new level when I received a black newspaper! 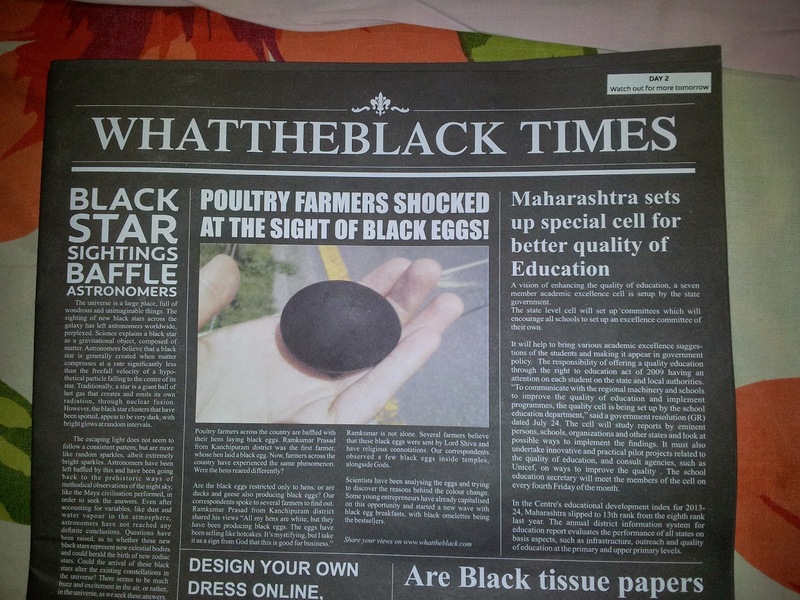 As I perused the newspaper which had some pretty interesting articles on hens laying black eggs, thus shocking the farmers; black star sightings baffling the astronomers; black tissue papers replacing the white ones; cricket embracing black balls which are believed to have more swing than their white counterparts and also the Indian cricket team sporting black on the Day 5 of the 5th Test which is yet to happen on August 19th! As the black egg made me relive Easter where we decorate eggs and hide clues inside them, maybe chocolate or jelly beans etc. 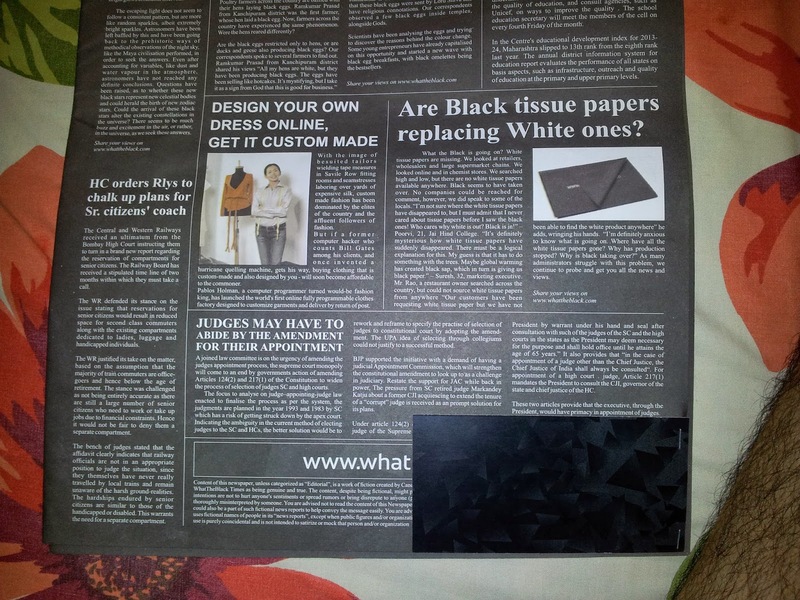 , today's black newspaper made me feel as if something significant is about to happen! Is the black symbolic of required change or is it something completely different? We are yet to know the answer to this. I also see all this in terms of white and black. White symbolizes purity and Black may be seen as symbolizing corruption. So this also can be the answer. May all the black money and corruption is linked to this. May be this event is against these evils. There are too many guesses but it's fun. I took several guesses to this question which was great fun..Meanwhile many of us got our guesses for today's surprise delivery proved correct..So cheers to all you #GuessMasters ! Can you guess #WhatTheBlack is going on? Join me everyday for the next three days on Facebook, Twitter and my blog where we'll try and crack this mystery! As #WhatTheBlack Times came and left me speechless yet again, I am curious to know what surprise tomorrow will bring at my doorstep? Can you guess the #WhatTheBlack item for tomorrow?